Posted on Wednesday, June 10th, 2015 at 5:29 am. Boxing‬ ‪History‬: June 9, 1978 – Fight of the Year!! Larry Holmes W 15 Ken Norton, Las Vegas. Holmes wins WBC Heavyweight Title. And so, Norton started slowly, very slowly, and he would say later that it was his critical mistake. With Norton tucked into his turtle defense and punching hardly at all, Holmes won four of the first five rounds, largely on the strength of the persistent jab. “Now it’s my turn,” Norton told Bill Slayton, his trainer, in the corner. In the sixth he shook Holmes with a powerful right to the head; in the seventh he hurt him with a right to the body followed by a left hook to the head. Midway through the seventh he banged Holmes on the left biceps with a looping right hand. For a moment Holmes thought the arm had gone dead. Now Norton really poured it on, advancing relentlessly, chasing Holmes and finding him often. After losing four of the first five rounds on all cards, Norton won five of the next six. But the violent pace had taken its toll; both men began to show signs of exhaustion. His jab working effectively once more. Holmes took the 12th. Then they exchanged two big rounds. 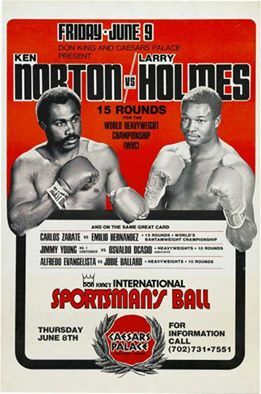 Holmes dominated the 13th, staggering Norton twice with right hands. Both had to push themselves to come out for the 14th; Norton pushed himself a little harder. Twice he staggered Holmes, and just before the bell he ripped him with six straight punches to the head and body. Norton, who was superbly conditioned, started strongly in the 15th—jabbing, hooking, pounding Holmes with overhand rights. Holmes threw four punches, then Norton was on him again. Blood was pouring from a cut inside Holmes’ lower lip, which had been split in the eighth round. The next morning it would need 11 stitches. “Move. You’ve got to move!” Giachetti screamed at him, and Holmes began to move. Ignoring the pain knifing through both arms, he also began to attack. They stood there toe to toe, no thought of defense, barely able to stand, but swinging. Then, punching furiously, Holmes took command and, just before the bell, staggered Norton with a right. Only with a great effort of will did each make it back to his corner without falling. Then came the decision.